Maple Top Benches Are The Industry Standard For Gym Locker Rooms. Hardwood locker benches have 1-1/4" thick maple finished top and sturdy steel base. Hardwood top has a heavy varnished clear top for splinter-free sitting. 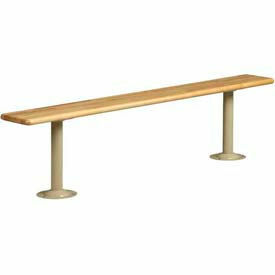 These wood benches measure 9-1/2"W x 17"H. Tube Floor Anchor Benches include tubular steel pedestal legs for stability. Steel pedestals have gray enamel finish. 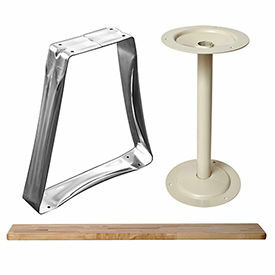 Trapezoid Floor Anchor Benches have 14 "W stainless steel base legs. Must be anchored to the floor for maximum stability. ADA Locker Room Bench Wall Mount Brackets . 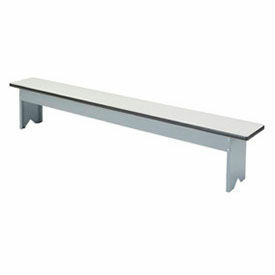 ADA compliant locker room bench top is an exceptionally strong and durable locker bench. 1-1/4" thick with two-coat catalyzed finish industrial grade maple hardwood top features radius on all sides and corners for comfort. Wall mount bracket is made of 1-1/2"W x 1/8"H steel bracket with reversible design. 3" x 3" notch for a wall cleat or wire run clearance. The bracket gets attached directly to a wall, so the wall acts as a back rest for conform to ADA Standards. 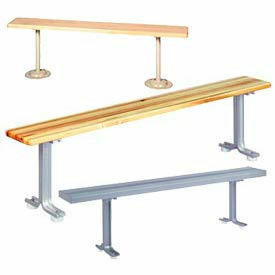 Lyon® Locker Room Benches Are Space Saving Seating Solutions For Locker Rooms At Schools, Gyms, Country Clubs And More. Locker room benches provide sufficient seating in small areas for user convenience. Benches are made of aluminum with lightweight, corrosion-resistant anodized aluminum, wood or laminate to provide long lasting strength and durability. Available styles are Aluminum Top and Pedestals, Hardwood Maple Top/Aluminum Pedestal, Hardwood Maple Top w/ Steel Pedestal and Plastic Laminate Top w/Steel Pedestal.Colors are Aluminum top, Hardwood top or Laminate top. Widths range from 36" - 120". Other dimensions vary per model. 9-1/2 W x 2 H bench planks feature softly rounded edges and center braces for comfortable seating. Made with painted steel pedestals. 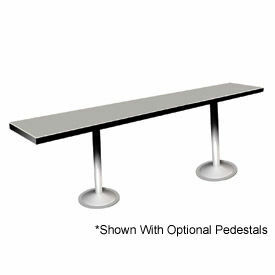 Aluminum and Steel Pedestals may be purchased separately. Dimensions vary per model. Plastic Top Locker Benches Are Reinforced With Heavy Duty Steel Framing For Extra Strength. Free standing locker benches have a 1-1/8" thick gray plastic top with safety rounded radius corners and protective black bullnose edging. These locker room benches offer wide rugged steel legs and a steel reinforcement with gray enamel finish for strength and stability. Locker benches measure 12"W x 18"H. Easy assembly. Hallowell Bench Tops And Pedestals Can Be Mixed And Matched To Provide Customized Seating For Locker Rooms. 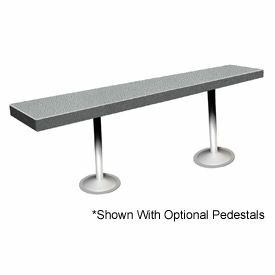 Hallowell Bench Tops and Pedestals are available in a variety of styles to meet specific needs. Bench Tops are made from laminated maple hardwood for lasting durability. Pedestals feature aluminum, cast iron, steel or stainless steel construction for maximum strength and support. Bench tops require two pedestals. Dimensions vary per model. 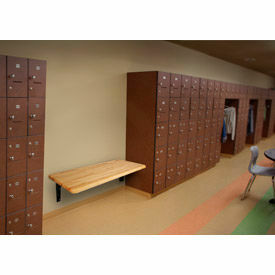 Tennsco Hard Wood Locker Benches Are Used Accompanient For Locker Units. Locker Bench Tops are made of 1 1/4" thick Hardwood Maple for long lasting durability. Locker Bench Tops require bench pedestals (sold separately) and measure 9-1/2"D x 1-1/4"H. Widths vary 36"-144". 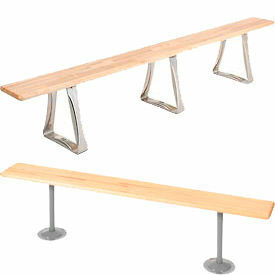 Stainless Steel Locker Benches Are Used By Schools, Gymnasiums, Outdoor Areas, Parks And More. 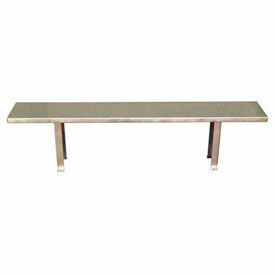 Stainless Steel Locker Benches are made of heavy duty, corrosion-resistant steel to provide long lasting durability. Formed 12 gauge legs have mounting holes to bolt bench to floor and provide additional stability. Standard bench surface is 12 " deep. Standard bench height is 18"H. Bench widths are 48", 72" and 96". Weight capacities are 800, 900 and 1200. Easy assembly. Unit ships Knocked Down for additional freight savings. Plastic Locker Benches are made of high density polyethylene that is impact and corrosion resistant. Lightweight, corrosion resistant, and very easy to clean. Available in different styles and colors. Backed by a Fifteen Year Warranty. Also, see options Gray Tube Pedestal and Stainless Steel Trapazoid for Locker Benches. Phenolic Locker Benches Are Built to Last and Hold Up to Extreme Conditions. ASI Phenolic Locker Benches are made of dense phenolic components and stand up to extreme conditions of moisture and humidity. They are impact, water, and corrosion resistant, and do not support bacteria. Perfect for county clubs and executive washrooms. Available in different styles and colors. Backed by a Fifteen Year Warranty.